Zentangle Fabric Arts – Quilting – Embroidery is the fourth and latest (October 2010) book from CZT®, artist, author and publisher Suzanne McNeill. Oh, you quilters and fabric artists (and interested bystanders) are gonna love this one! The book includes 38 patterns for drawing (13 new ones by my count) and 30 patterns for free-motion quilting. In addition to the patterns, there are about 20 projects to inspire you. The projects are all Zentangle eye candy! Both materials required and complete instructions are given. ATC cards by Gail Ellspermann. Zentangle: Fabric Arts is the same physical dimensions (8.5″ x 8.5″) as Sandy Bartholomew’s Totally Tangled book, and contains 52 pages including soft covers. Whether or not you are a fabric artist, there is all kinds of great inspiration in here. Zentangle: Fabric Arts – Quilting – Embroidery is full of excellent tips for working with fabric and lists the specific supplies to Zentangle with each fabric project. 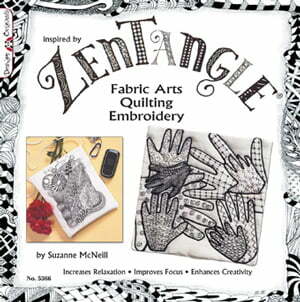 This is another must-have book for your Zentangle library! I’ve seen Tangled tennies on several sites and would love to try them. I’m looking for an inexpensive pair to try it on, as I’m not sure whether the Micron ink will spread on the canvas shoes. I’d rather try it on a cheap pair first! I’m a quilter and one of the things that drew me to Tangling is that it will also work well with free-motion quilting or even quilts themselves. I am considering scanning the pictures into my computer, printing them on fabric, then making a “Tangle Sampler” quilt. I got a great pair of (leather) Keds at a local discount shoe warehouse (DSW) for $24. and used a double-ended Sharpie marker. They worked out great and I get lots of comments. Utrecht Art sells blank canvas Keds for quite a bit more, but it’s another option. My next project is to use a White Sharpie paint marker for my black shoes (Old). I used white canvas Converse sneakers that were on sale at Target, Kohl’s, and Fred Meyer (in Washington) and they all turned out great. I used the micron for drawing and then fabric dye pens for coloring. They are fun to do and fun to show off!